These three high-interest, no-prep passages are perfect for practicing close reading and reinforcing reading strategies. Everything you need is on one page. Each passage is presented at two reading levels (3-4 and 4-5) for easy differentiation. The included Show What You Know questions are identical for both reading levels. 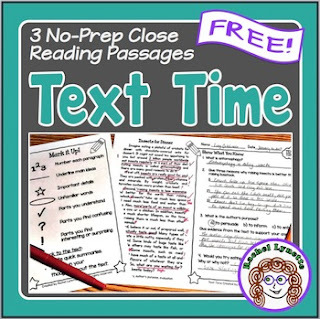 This allows you to discuss the passages altogether, even if you have students using different levels. A half-page annotation guide and answer keys are also included. These passages were written by me, Rachel Lynette. I am a published author of over 120 nonfiction books for children on a variety of subjects. I have written for publishers such as Harcourt, Thompson-Gale, Rosen, Children’s Press, Evan-Moor, and several others. You can find my books on Amazon (I also write under the names: Lynette Robbins and Tori Miller). These passages are well-researched, well-organized, and age appropriate. They are no different than those you would find in a published nonfiction book.